Teaching science is really hard sometimes. There’s so much content to get through plus, your students need to perform labs. Materials are expensive, labs take forever to set up and take down plus there’s the marking. There’s also the problem of inconsistent results and tedious procedures. My Science Lab Station Activities are meant to get your students out of their seats and engaged in the content. Each not only offers a unique opportunity to test your students’ knowledge (provide an opinion, answer questions based on a video or reading, draw, etc. ), but also provides a fantastic learning opportunity where your kids will learn through assessment. There is almost no prep for you. Simply print the cards, lay them out around the room and you’re all set. An answer key is also provided where applicable. 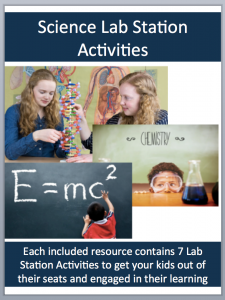 Here are my available lab station activities. Click on any one to read a complete description and see what others have said.